Arthur Brooks is a bestselling author, a social scientist, and the president of the American Enterprise Institute. 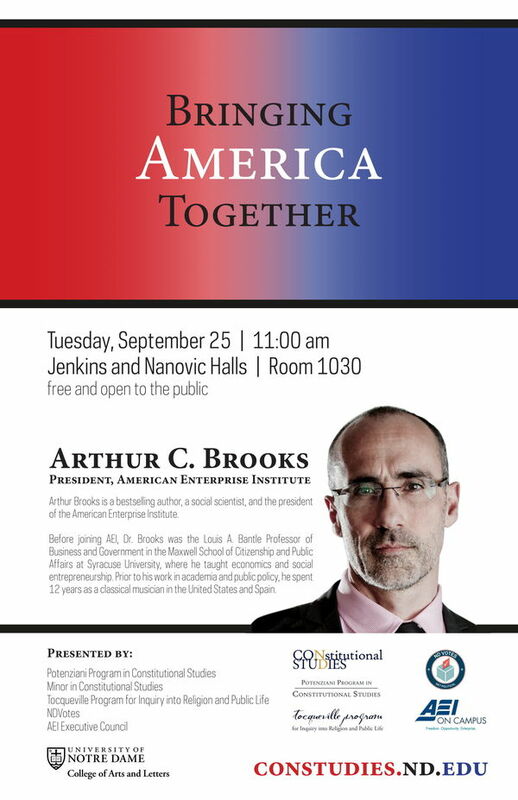 Before joining AEI, Brooks was the Louis A. Bantle Professor of Business and Government in the Maxwell School of Citizenship and Public Affairs at Syracuse University, where he taught economics and social entrepreneurship. Prior to his work in academia and public policy, he spent 12 years as a classical musician in the United States and Spain. Presented by the Potenziani Program in Constitutional Studies, the Undergraduate Minor in Constitutional Studies, the Tocqueville Program for Inquiry into Religion and Public Life, NDVotes, and Notre Dame’s AEI Executive Council.